The “Zone of Creativity”—when the consumer gives their permission to the restaurant operator to innovate with strict parameters. Consumers have greater health and wellness expecations from restaurants, and operators are doing a better job of listening. But does the consumer lie to them or to themselves? Each day we tell ourselves we want to eat healthy, but then we don’t. Consumers order salad but then add several ladles of sweet dressing on top. They insist that restaurants, particularly fast-food chains, aren’t healthy, but when healthy options exist, they still choose indulgent, less-healthy products. Burger King listened to consumers and tried to “satisfy” them. The intention: a lower-fat, lower-calorie french fry that was aimed at giving consumers more choices and healthier fare. The result: higher prices, lower demand and kitchen complexity that led the burger giant to discountinue the fries at a majority of stores less than one year after their debut in September 2013. 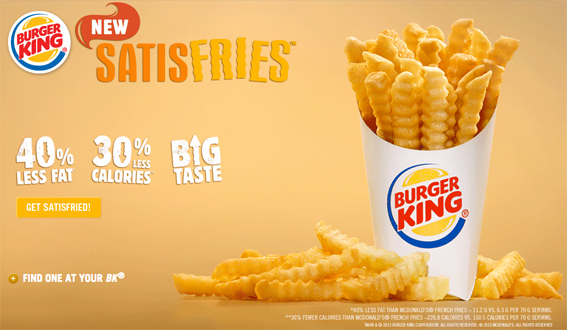 First, BK priced the product higher than its standard french fry offering, making price part of the decision to eat healthier. When low- to middle-income consumers consider the price differential, they will generally go with lower price for a similar product, especially when they understand what they are getting from past purchases. Second, the consumer perception of healthy food at fast-food restaurants may have come a long way, but it isn’t quite where it needs to be. Consumers don’t always trust restaurants to provide healthy food in a way that tastes good. With negative implications on “healthy,” getting consumers to believe is a challenge. Lastly, the kitchen complexity for the BK operator needs to be simple to maintain speed of service. Having to manage two different preparations for regular and Satisfries adds complexity to the back-of-house logistics in preparing the side, keeping it fresh and serving it hot. Giving consumers fewer options by shifting to the new Satisfries could have been a more risky “all in” strategy but may have had a greater chance of success by focusing on one product instead of two. Keeping prices the same would also take the complexity out of the decision. Also, by positioning Satisfries as premium instead of healthy, consumers would have felt like they were getting a better-for-you product that would be worth a higher price, and their perception of health may have driven by quality and not by calories. By the way, it’s not every day that we get to feature two perspectives on indulgent french fries. Check out my piece on the return of crinkle-cut fries at Shake Shack here. This entry was posted on Thursday, August 14th, 2014 at 1:00 pm and is filed under Uncategorized. You can follow any responses to this entry through the RSS 2.0 feed. You can leave a response, or trackback from your own site.